Bathrooms can make a huge impact on the overall aesthetic of your home. 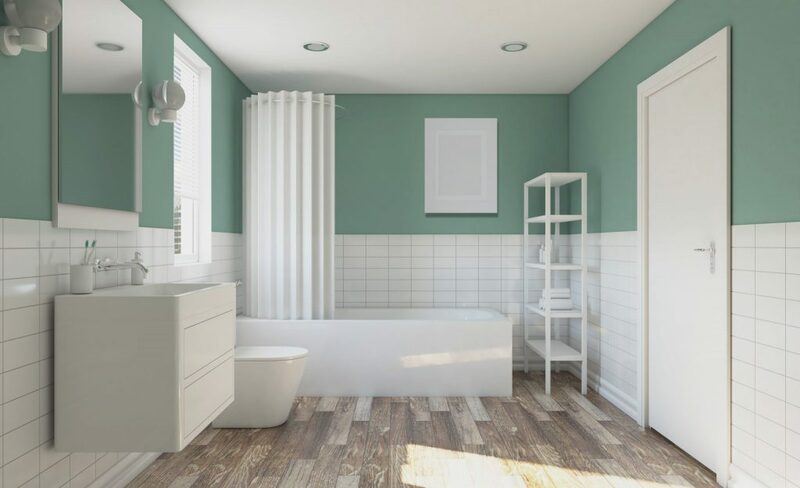 Many people have outdated bathrooms because of the common misconceptions surrounding the ease and cost of remodeling a bathroom. One quick way to spruce your bathroom up without a full remodel is to reconsider your color scheme. It can be hard to determine a good color because typically the bathroom receives the least amount of natural light in the home. It is important to get samples and paint cards to test the color before applying it to the walls. The exact colors you see in photos or magazines can be a good option to use as samples because this is generally how they will actually look under the hue of artificial light. Even colors that seem neutral can have vibrant undertones, so it’s important to test your paint cards and look at it them different times of the day before deciding. You can pick your colors based on a variety of factors. Think about what look you are going for- is it tranquil and serene? Bold and colorful? Trendy and stylish? You want to pick something that will last over a long period of time as you don’t want to have to repaint any time soon. Soft and neutral colors like light gray and sage greens will provide a relaxing and spa-like feel, and you can also pair neutrals with pops of other colors through accessories and decorations. With neutrals, you can change these accent colors out whenever you want as opposed to repainting the whole powder room. Whites and creams give bathrooms a very clean, high-end feel and pair well with marbles and white trim. Bright colors like blues, greens, and oranges, provide a punch of color and personality to a smaller space and can be toned down with white and neutral accents. You also want to choose samples that match things in the room that you will not be remodeling, for instance, the flooring. For a cohesive feel throughout the whole powder room, it’s important to make sure all of the colors flow and there’s consistency throughout the theme of the powder room, with the colors, the flooring, the tub, the vanity, and countertops. Your powder room will look more complete and high end if it all flows together, and paints can be a great way to tie it all together. Although when you walk into a home improvement store there are always a variety of wall colors to choose from, another important decision you need to make is type is what type of paint to use. One of the best paint options is semi-gloss. The texture gives it a shiny and sealed finish. This is ideal for bathrooms as it repels moisture and will prevent mold and mildew from developing. Typically all paints at the glossier end of the spectrum will resist mold and mildew well. Repainting your bathroom is a great way to get a fresh new look. It’s an inexpensive way to update your space if you’re not ready for a full remodel. If you have questions about paint colors or remodeling your bathroom in general, give Columbus Bath Design by Luxury Bath a call today.